Last evening was a delight, with Michael Geist delivering the annual Hart House Lecture. Michael spoke to a sold-out crowd on Our Own Creative Land: Cultural Monopoly and the trouble with copyright. He regaled the audience with the unfortunate tale of sad Sam, and wowed people with what he called not the good news story, but the great news story: how the Internet has enabled an explosion of creativity and collaboration. He went on to suggest that we ain't seen nuttin' yet by comparing the Internet of 1995 to the Internet of 2005, and casting ahead to 2015 and 2025. What has emerged is a new group of stakeholders, namely the vast legions of people who now have voice, representation, and the ability to participate in what I call the new mass media - not media for the masses, but media by the masses. This means that traditional stakeholders - the so-called creative industries, publishers, industry lobby groups, tariff cartels, and the like - will not be "entitled" to the type of influence they have enjoyed in the past in the formation of public policy. Geist called for an approach to balance in intellectual property law - copyright, certainly, but equally applying to patent law as well - that contemplates not only the requisite balance between creators and users (since all creators are users, and all users are creators). New policy must understand that innovation, creativity, the continued emergence of culture and our fundamental freedoms (like freedom of speech) are all at stake. Moreover, as we are seeing manifest in the United States dominance of the WIPO agenda, the ability of emerging countries to survive and thrive is increasingly at stake with policies that overwhelmingly favour those who already enjoy privileged access, and privileged protection. All in all, a great show. Links to resources related to the lecture are available. How 'bout a Whole Gulag? Funny story over at the blog that calls itself a newspaper - the Globe and Mail: Seems that Conservative MP Colin Myers took advantage of the boss taking his duct tape with him to Mexico to say "boy, would the public get accurate and true information if a few reporters were hauled away to jail!" Perhaps said partly in jest - the command of hyperbole being an asset to get the attention of the newsmedia - the backbencher's comments reveal a profoundly disturbing - and consistent - attitude that seems to be emerging in patterns of behaviour from the new government with respect to overarching and total control. While those in political power must have a vision, the reality of contemporary life is that the blind imposition of that power is no longer appropriate - indeed if it was every appropriate - in a world that is increasingly enabled for mass participation. More voices can be heard, and should be heard - not fewer. More aspects of stories can emerge, and should emerge. If a substantial number of those willing to participate in the ongoing conversation that defines contemporary democracy observe things that those in power would call "twisted" or "fabricated" then what we need are even more people having a close look. What we don't need is those in power deciding what should be discussed among the public, especially if it is critical of those in power. There are plenty of places in the world where that is, sadly, the only option. Organizational effectiveness, as it is conventionally constructed, typically addresses issues of an organization’s ability to access resources and achieve objectives. Relative to an organizational culture comprised of tacitly held underlying assumptions, organizational effectiveness can alternatively be used to probe and reveal aspects of that culture, making explicit the cultural constructs that contribute to both espoused and in-use theories. By reconceiving the notion of effectiveness to emphasize the effects created in the complex environment within which the organization exists and interacts, the organization can reconceive its theories of action by balancing four primary competing values – focus, structure, outcomes, and orientation. In doing so, an "Effect-ive Theory" of action can emerge that incorporates processes of feedforward, manifesting anticipatory environmental perception. Yeah, it's a bit of an abstract abstract, I know. Essentially, it says, in order to be effective in a UCaPP* environment, you must create processes to detect the effects you are creating throughout that environment, and then grow the processes to be able to anticipate those effects. In other words, I'm calling for a campaign to repeal the law of unintended consequences! I just had a conversation with a journalist from the Ottawa Citizen about blogging, and how it changes life, the universe and everything (yeah, yeah...). She reminded me of Baghdad Burning, a compelling first-person blog written by "river," a woman in the heart, and heat, of the ongoing war. ... Three years later and the nightmares of bombings and of shock and awe have evolved into another sort of nightmare. The difference between now and then was that three years ago, we were still worrying about material things- possessions, houses, cars, electricity, water, fuel… It’s difficult to define what worries us most now. Even the most cynical war critics couldn't imagine the country being this bad three years after the war... Allah yistur min il rab3a (God protect us from the fourth year). There is a wonderful satire of the Oscars that gives an overview of the political players as she perceives them. But most of all, it is the compelling nature of her voice as she weaves her stories that draws in the visitor to her site. I was asked how we know that she is real, that she is telling the truth about who she is and what she's describing. Of course, we should be moved to ask the same about the conventional mass media. But even if "river" is an adopted persona of a fiction writer safely sitting somewhere in Europe - and I have no reason to think so - the writing describes a perception of Baghdad that is an important addition to the story- and meaning-making that is Iraq today. Manuel Castells (1996) traces the evolution of organizations – particularly vertically-integrated corporations – through the 20th century, and especially, through the latter decades of the century as instantaneous electronic communications and information technologies have augmented organizations’ scope and reach. The most important obstacle in adapting the vertical corporation to the flexibility requirements of the global economy was the rigidity of corporate cultures. ... In the 1980s, in America, more often than not, new technology was viewed as a labor-saving device and as an opportunity to take control of labor, not as an instrument of organizational change. I propose a definition of the network enterprise: that specific form of enterprise where system of means is constituted by the intersection of segments of autonomous systems of goals. Thus the components of the network are both autonomous and dependent vis-à-vis the network, and may be a part of other networks, and therefore of other systems of means aimed at other goals. The performance of a given network will then depend on two fundamental attributes of the network: its connectedness, that is its structural ability to facilitate noise-free communications between its components; its consistency, that is the extent to which there is sharing of interests between the network’s goals and the goals of its components. His examples are organizations and enterprises that have been enabled by the technologies that have enabled so-called globalization, that are sometimes more amorphous, and sometimes akin to the composite entity created when one considers a corporation and its supply chain in toto. What Castells has not done is specifically account for the plethora of permutations and combinations of people organizing to collectively accomplish a set of objectives (irrespective of whether all objectives are explicitly shared by all participants). In other words, by creating the new conceptual construct of network enterprise, Castells avoids the (rather messy) necessity of defining organization, or creating a unifying conception that might usefully connect organizational artefacts of the past to artefacts of the (present) future. If one considers an organization as a distinct, definable entity, with discernable and definable boundaries, it should be relatively easy to determine whether any given individual is a member of the organization or not. In practice, this is not so easy to accomplish as network-like effects begin to be observable. Are seasonal or temporary contract workers members of the organization for which they work? How does one account for project teams whose members might be employed by multiple, distinct companies? Is a volunteer who works daily as “equal” a member as one who only works once a week – or once a month? How does one measure the size of the volunteer organization to which both belong? Can we account for consultants who are intrinsic to in-house project teams for the duration of a project, but may also be working for other companies simultaneously? While each of these situations is directly explainable by Castells’s network enterprise construct, defining the practical extent of each of the organizations is not. I suggest that the difficulty is related to our conventional conception of organization as a box or container, within which are the participants, much like Pennings and Goodman’s “organizational set,” and Castells’s construct in terms of networks of “components.” Rather than defining an organization in terms of a network of its components (subunits, individuals, functions) consider instead a network of relationships that interconnect components. Thus, an organization can be considered to be an emergent entity, relative to a contextual ground, comprised of a network of relationships and effects among autonomous components, each of which may be an individual or an organization similarly defined. An organizational entity is therefore delineated according to the valence and regularity of those relationships, where the understanding of valence is drawn from a elemental, chemical analogue: The ability of a substance to interact with another or to produce an effect; the capacity of something to unite, react, or interact with something else. In a conventional organization, the valence of relationships is relatively strong and regular (e.g., through hierarchical and administrative structures) within, and relatively weak (say through contractual relationships) without. The organizational boundaries may be semi-permeable, but the shape is well-defined (think of a solid). In a so-called virtual organization, or distributed team, or community of practice, the valence of the bonds are relatively weaker so the organization is perhaps somewhat more amorphous (think of a liquid), but nonetheless interconnected with a degree of mutual interdependence that maintains the valence. If several members of the community of practice decide to collaborate on a specific project, the valence of those specific relational bonds strengthens, possibly to the point of creating something that resembles a traditional organization. The former community of practice is not necessarily destroy; inevitably, it is changed via the complexity effects introduced by changing the valence of those particular relationships. The organization that was the former community of practice takes on a different shape to a greater or lesser extent, depending on the multiple valences of the remaining relationship and effects bonds. Of course, lots of issues and implications remain to be figured out over the next phases of my research, such as the diverse nature of the bonds, how to reconceive pragmatic aspects of organizational design and management, how to negotiate the challenges to conventional conceptions (for example, I think that the notion of “permanent” and “temporary” workers no longer has meaning in a valence theory of organization; there’s probably a hundred more similar constructs that must be reconsidered). This is brand new, and very raw, thinking for me, but I suspect that by understanding organizations as networks of relationships (of variable valence), all of our prior organizational thinking can be accommodated, our current challenges can be explained, and our future can be anticipated – all through a useful and comprehensive vocabulary. Many poker players have a "tell" - a little tic or mannerism that allows other players to know when something's up, either a bluff or a flush. President Bush has a "tell" - it's that little smirk that he works so hard to control during news conferences. It's particularly "telling" when he gets "real earnest-like." Have a look at the way he bowls over White House Press Corps veteran, Helen Thomas, in this video [wmv; qt-version] and watch for the tell-smirk. Then read the "transparency" version corroboration of the president's "tell." How is the notion of Organizational Effectiveness constructed? Is our conventional notion of effectiveness still valid in a world that is increasingly interconnected, and therefore, interdependent? How can this clichéd construct be reconceived to provide a new insight into the nature of organizations, and the effects they bring about in the context of a ubiquitously connected and pervasively proximate society? Join me for an exploration of these questions in an open seminar that reviews my current work-in-progress – part of my quest to find The Organization of the Future. Update: Thanks to all those who attended, and especially for the spirited conversation that followed the formal seminar. Here are the seminar notes, with references. Rob Hyndman has a good analysis of the upcoming commercial radio hearings at the CRTC, and a view of briefs-to-come from those whose business model oxen are in the process of being gored. Essentially, commercial radio broadcasters are suddenly waking up and noticing that fewer people are listening via FM because more people are listening via IP (that's Internet Protocol). It's not as if we haven't seen this before - any professional blacksmiths out there in the audience? Podcasting and clever incarnations and experiments in streaming music (like the very cool Pandora) have, to be perfectly trite and cliché-y about it, reinvented radio. Actually, it's more like a retrieval. The point is that radio is an intimate medium - the on-air content is delivered to the listener for her/his personal and intimate enjoyment. Direct to the ears. Radio was never a social medium (although it was, according to McLuhan, a socializing medium.) Podcasting and services like Pandora retrieve this effect in a new way, and intensify it, essentially obsolescing the business rationale behind conventional, commercial, broadcast radio. The CRTC is going to hear a bunch of whining from those companies who are vested in the old way, and have not been paying attention to the train that's been barrelling down on them for the past half-dozen or so years. There will be calls for loosening content restrictions, and an equivalent volume (as in loudness) for tightening content restrictions. However, not only has that horse bolted from the barn, but the barn has burnt to the ground! The CRTC can do nothing - and should rightly do nothing - to fiddle with content in a faint-hope attempt to make an obsolesced business model (not obsolesced medium - conventional over-the-air radio has been obsolesced since the mid-1950s) live again. Broadcasters - and especially the public broadcaster - should begin to understand the Internet as a social medium, and rejig their businesses to exist happily in a UCaPP world. While these dynamics may not seem particularly important, they are essential to youth because they are rooted in the ways in which youth jockey for social status and deal with popularity. Adults often dismiss the significance of popularity dynamics because, looking back, it seems unimportant. Yet, it is how we all learned the rules of social life, how we learned about status, respect, gossip and trust. Status games teach us this. If this is indeed the case, then MyDeathSpace fulfils a complementary role, completing the construction of identity for those whose lives have been tragically cut short, providing the ultimate, and final, peer validation. In some cases, the memorials may be irreverent, but these few do not detract from the effect of the site. Construction of identity is indeed real in cyberspace and transcends the intangibility of the medium. Death, that for some youth is not perceived as real, also transcends intangibility; it is its tactility - the ability to touch - that is experienced. The Village Voice reports on a story that has been completely ignored by the usual massmedia suspects; this, of course, is nothing surprising. Freedom (read: independence) of the press only exists in a democratic state. The story has to do with Maher Arar, the Canadian citizen who was kidnapped by the CIA and sent to Syria to be tortured. Released after a year in brutal captivity, and never charged with anything by Syria, the U.S., or Canada (or anyone else, for that matter), Arar sought recourse by suing the U.S. government in U.S. Federal Court. The judge who heard the case, one David Trager, dismissed the lawsuit, saying, among other things, that the judiciary doesn't have jurisdictional oversight when it comes to such matters (like the executive branch breaking the law), and that ruling in favour of Arar's claim would compromise foreign governments that are cooperating with the U.S. in such illegal matters. Believe it or not. Representing Arar for the New York–based Center for Constitutional Rights, David Cole predicts ... that if Judge Trager's ruling is upheld in an appeal to the Supreme Court, the CIA and other American officials will be told "they have a green light to do to others what they did to Arar"—no matter what international or U.S. laws are violated in the name of national security. Following the dismissal of Arar's case by Trager (former dean of Brooklyn Law School), Barbara Olshansky (deputy legal director of the Center for Constitutional Rights) underscored the significance of what Trager has done to legitimize the Bush administration's doctrine that in the war on terrorism, the commander in chief sets the rules. Said Olshansky: "There can be little doubt that every official of the United States government [involved in the torture of Maher Arar] knew that sending him to Syria was a clear violation of the U.S. Constitution, federal statutes, and international law . . . This is a dark day indeed." This is the next installment in what has become an online seminar in organizational effectiveness. For the previous installments, you can find the links in the category post on Organizational Effectiveness, and the Future of Organizations. Separating the various clauses in Schein’s definition enables a more careful probing of the specific dynamics that enact the emergence of an organizational culture. From the first two clauses it is clear that culture is a tacit, non-explicit, emergent phenomenon that is, nonetheless, actively constructed by a group. The fact that Schein chooses to define it as patterns of assumptions – that subsequently manifest as responsive behaviours – suggests that much of said construction may occur reflexively, in the absence of active awareness or overt, reflective consideration. Moreover, as a reflexive construction that may occur below the threshold of consequential awareness, the emergence of these patterns of assumptions might not be consistent with espoused intentions, let alone what Argyris and Schön (1974) might characterize as espoused theory – a line of thought to which I will return. The reflexive learning that coalesces patterns of assumptions is done in response to “problems of external adaptation and internal integration” (1990, p. 111), consistent with Quinn and Rohrbaugh’s (1983) focus axis. That the learning is done in response to problems suggests that, as a matter of practical experience, cultural learning may be unavoidably contextualized by collective and cumulative expediency. In other words, the solutions from which underlying assumptions are tacitly extracted have worked “well enough,” according to some dominant subgroup that considers the solutions valid. A critical perspective would necessarily question the mechanisms whereby dissenting voices on the validity of the extracted assumptions would systemically be prevented from being heard, and more important, prevented from incorporating alternative patterns into the emerging cultural construct. Such critical probing would undoubtedly reveal more of the hidden ground of the culture, and its constructive processes. The means through which these newly developed or discovered assumptions are taught to new members also reveals much about the indigenous, extant organizational culture. Clearly, according to Schein’s final clause, it is normative responses, attitudes and behaviours that are being taught. The teaching is effected through whatever learning mechanisms have been previously found to have “worked well enough to be considered valid” (1990, p. 111). Again from a critical ground, I am moved to query what constitutes working “well enough.” Is there a mechanism to challenge the ultimate validity of pattern assumptions that might result in indirect, unexpected, or unintended outcomes that may be sufficiently removed in time, space, or both to be causally connected to the prior learning? The all-too-common cliché of “unintended consequences” – so prevalent as to be colloquially referred to as a “law”– suggests that such a feedback mechanism is widely lacking. Traditional organizations often exist as relatively closed, culturally-independent societies with distinct barriers between themselves and the so-called outside world. For such organizations, the expedient construction of emergent cultural assumptions, in the general absence of active awareness of temporal or geographical outcomes and effects is, to say the least, highly problematic. Indeed, what would be more useful is a means of feedforward, or anticipatory environmental perception, embedded in the experience of cultural learning. Almost every author from whom I am drawing for this investigation speaks of organizational effectiveness in terms of values, or underlying assumptions, or adaptations to internal and external influences, or combinations thereof. I would suggest that Schein’s conception of culture that directly addresses these terms offers a useful connection – a shorthand, if you will – for the contextual grounding within which an organization’s specific construct of effectiveness can be understood. Further, I propose that the unique evolution of a given organization’s culture – even within a common societal context – makes empirical comparisons of effectiveness among organizations a study not in relative goal attainment (for instance), but rather a proxy for the comparative investigation of cultural assumptions, values and processes through which adaptive enculturation occurs. Such an approach to understanding the relationship between organizational culture and organizational effectiveness explains why, for example, Quinn and Rohrbaugh’s competing values framework is such a useful diagnostic tool to gain insight into the nature and characteristics of an organization. One can easily see how it could be used to compare nominally similar organizations for difficult-to-observe differences in their respective values grounds, or how two distinct organizations with common origins (say, the result of divestitures or spin-offs) have come to differ over time. What this means is that organizational effectiveness is actually a detector of sorts for corporate culture, essentially demonstrating what the company actually values, that, in turn, leads to espoused theory vs. theory-in-use. How organizational effectiveness is constructed, and the processes that lead to that construction, reveal much. On the other hand, when organizational effectiveness reporting becomes routine – essentially a cliché – unawareness sets in once again, permitting divergence between an expediently changing theory-in-use and a rote-repeated espoused theory. What’s more is that what I’m calling effect-ive theory – the held conceptions concerning the intended effects within the greater environment – never hold espoused theory to account because there is no corporate mechanism to do so (save radical intervention, at least at the moment). Now, I’m approaching the ability to build a plan for research, to discover effect-ive organizations, and ultimately, characteristics of the organization of the future. Over time, I will be looking for participant organizations, hopefully representing a wide variety of sectors of society, worldwide. If you are a member of an organization (and especially if you are a decision-making member) that might be interested in participating and benefiting from the insights you may achieve (I’m a big believer in action research), drop me a line so that I can remember you when the time comes. Well, according to a report in the Toronto Star, this woman is a living, breathing, walking blog. Give her a date and she can tell you what took place — whether it was the final episode of the television soap-opera Dallas, the day actor Robert Blake's wife was killed, the day of the Lockerbie plane crash, the Iranian invasion of the U.S. Embassy, the day Proposition 13 passed in California or the day a plane crashed in Chicago. She can tell you what she was doing at the time. She remembers the weather. Her life is like a movie on an endless loop, full of emotion. She cannot escape any good or bad thing that ever happened to her. During this election campaign, I've written about this theme [of hidden ground] relative to the leaders, and the nature of the campaign itself. I've also described the mechanisms through which we each make up our minds, (and justify it later). Most importantly, I've described why the medium of the campaign, and the way each party is carefully (sometimes not so carefully) conducting itself, is likely misleading a vast number of voters into making a decision that they might otherwise have not made. Today, a small slip in an otherwise near-flawless performance by candidate Harper, that gives us a glimpse of that ground the Conservative party is trying desparately to hide... let there be no mistaking the fact that Stephen Harper's contextual ground - his worldview through which he would develop the actual policies that run a government - has not changed one iota from his Reform/Alliance roots. Today, the Globe and Mail is reporting on how the ground is becoming considerably more clear in Stephen Harper's response to Ethics Commissioner Bernard Shapiro's inquiry into turncoat David Emerson's appointment to the Cabinet. Prime Minister Stephen Harper's refusal to co-operate with an investigation by the Ethics Commissioner would break a promise he made during the election campaign, opposition MPs said yesterday. Mr. Harper's dispute with the commissioner also appears to have set the stage for a fierce battle between his minority Conservative government and the opposition when the House of Commons returns next month. Under the heading "Strengthen the role of the Ethics Commissioner," the document says: "Stephen Harper will . . . prevent the prime minister from overruling the ethics commissioner on whether the prime minister, a minister, or an official is in violation of the conflict of interest code." Even Ed Broadbent, Parliament's elder statesman when it comes to ethical conduct, has a raised eyebrow about this the controversy (and have you seen Broadbent's eyebrows?). “The Prime Minister put him in a position that he can't resign now. You can quote me on that,” Mr. Broadbent said in an interview Wednesday. “It will look like he was hounded out of office and then it will make it difficult for anyone coming in to look like other than someone who is going to be totally acceptable to the Prime Minister. ... For what it's worth, Mr. Harper is right in implying that the ethics code doesn't apply,” said Mr. Broadbent. But it is not for the Prime Minister to make such a judgment in his own case, he added. Moreover, by refusing to co-operate with the investigation, Mr. Harper is breaking an explicit provision of the conflict code. As I don't live in Vancouver-Kingsway (Emerson's riding), for me, this is small potatoes. The more significant - and troubling - issue is this: If Harper is true to his ground, we could expect to see a variety of moves that would slowly but irreparably transform this country into something that, looking southward, I would guess most Canadians would resoundingly reject - if only they were paying attention! Don't say I didn't warn you. In Toronto, I have had informal conversations with representatives from both Bell (Sympatico) and Rogers, the two major broadband ISPs in this geography. My advice to either or both of them is to quickly enter a partnership with the city to develop a public WiMax infrastructure covering all of Toronto. While this may cannibalize a small amount of their extant ISP access and cellular business, history has demonstrated time and again that those businesses which resist technological advancement in favour of a fundamentally obsolescent business model, lose. Period. But did they listen? Noooooooo. Well, it seems someone was listening, more or less. Today Toronto Hydro Corp. is expected to announce plans to bring "municipal Wireless-Fidelity"* (WiFi for short) to Toronto. It's a mesh of radio signals that can blanket an entire city, giving subscribers wireless Internet access virtually anywhere. WiFi receiving and transmitting units will be mounted on items of urban furniture, like street lamps or pay phones. They'll pick up radio waves carrying the Internet and pass them on from street lamp to street lamp. The waves will course up and down every street in the city, through parks, schoolyards, markets and pool halls. Subscribers will surf the Internet on a park bench or in a shopping mall. An increasing number of cities throughout North America and around the world are realizing that connectivity is increasingly being considered a "public good" - something worth investing in for the growth and well-being of the community. While commercial ISPs may complain that it is not within the public's domain to enter a commercial market with taxpayers' money, I would point out that Toronto Hydro is now an arm's-length agency, no longer a city department. For them, offering muni-WiFi is a fortuitous adjunct to the core business. The primary purpose for the WiFi network is to be able to monitor the so-called smart meters that measure electricity consumption hour-by-hour throughout the day. That Hydro can recoup its capital investment through indirect, incidental revenue is consistent with the UCaPP world it helping to construct. Wake up Bell! Wake up Rogers! Wake up Telus! Vonage is already doing this in New Jersey! What's "this?" "This" is delivering Voice over IP via WiMax, which in an urban area looks a whole heckuva lot like 1x digital cellular - in other words, voice, text and web access via a mobile device at many times the speed, at a fraction of the cost for the average user. 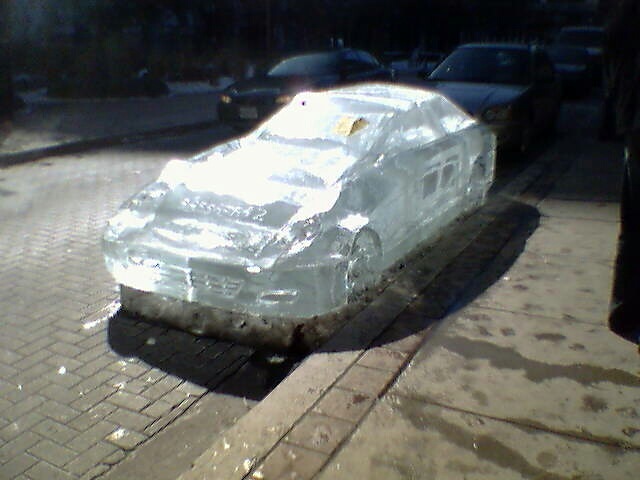 An "illegally parked" ice sculpture car, outside of Toronto's Sassafraz restaurant, in Yorkville. Complete with parking tickets! Thinking out loud about organizational effectiveness, part 3. Part 1 deals with espoused, in-use, and what I call effect-ive theories. Part 2 discusses and extends the competing values framework for organizational effectiveness. This post focuses on organizational culture. Warning: this, too, is a long post. what a group learns over a period of time as that group solves its problems of survival in an external environment and its problems of internal integration. Such learning is simultaneously a behavioural, cognitive, and an emotional process. Culture is manifest in observable artefacts, values, and underlying assumptions – a researcher could, for example, pay attention to formal artefacts, such as mission or value statements and policy guidelines, as well as performance evaluation criteria, activity reporting cycles, the nature of social events, the way in which emails are signed off, and the arrangement of offices (and/or cubicles). When interpreted relative to the dual grounds of espoused theories and theories-in-use, values that are the precursors to culture can be discovered. Values that have “withstood the test of time” and are no longer questioned comprise the underlying assumptions of culture. These can be especially strong if, for example, the organizational learning that contributed to the development of those values was “traumatic … which leads to the group counterpart of what would be repression in the individual,” according to Schein. Cultural values and affective behaviours are passed from generation to generation of organization members through repeated behaviours modelled by leaders and other “old-timers” in their responses to critical situations. These become embedded among the membership via noting what leaders pay attention to, measure, and control; role modelling in “normal” or ordinary circumstances; demonstrable reward and punishment criteria; and hiring, firing and promotion criteria. Additionally, cultural values are communicated and learned through persistent organizational myths and legends that exemplify normative behaviours, attitudes, and values; physical organization of office environments and daily interactions; and organizational semiotics and linguistics – the affective buzzwords, slang, and in-jokes. as the correct way to think, feel, and perceive in relation to problems (in other words, imposed normative responses, attitudes, and behaviours that may be very local, and inconsistent with those of the greater society). When decomposed in this way, it becomes clear that Schein’s definition is particularly applicable to traditional organizations that exist, more or less, as relatively closed, culturally-independent societies with distinct barriers between themselves and the “outside world.” While there is nothing that prevents members from introducing outside values into an organization’s cultural fabric (indeed, I would agree that the immediate societal environment plays a large role in the initial establishment of an indigenous organizational culture), the process of adaptive enculturation that Schein describes, as well as many people’s lived experience of cultural change – as experienced when moving from company to company, or perhaps more dramatically seen when two culturally distinct companies merge – generally tends to preclude such infiltration. I would contend that throughout the 20th century, each era of dominant management thinking provides the primary ground within which certain cultural adaptations are considered acceptable and others are not. These would reflect the baseline of dominant organizational values active at the given time. In other words, values that emerge from collective experience and resultant learned responses in the context of any given organization are based on the dominant theory or paradigm of the day that attempts to explain and prescribe appropriate responses (that might include behaviours, but not exclusively) to challenges of external environment and internal integration. Conversely, a change in paradigm, of necessity, renders a change in the contextual ground within which culture and values have meaning, and hence, introduce perturbations in the collective perception of what responses work “well enough,” thereby challenging the existing culture in an otherwise relatively stable organization. The notion of the existence of a “correct way” to think, feel, and perceive for instance, is similarly called into question in the context of today’s emergent form, namely, a continually evolving enterprise, or among enterprises that exist in a continually evolving and unstable environment. This is perhaps especially true under UCaPP (ubiquitously connected and pervasively proximate) conditions that are characterized by Castells’s (1996) “network enterprise”: the static notion of Schein’s organizational culture must necessarily break down. The corollary to this reflects one of the basic problems of organizational change itself. Any vestigial remnants of cultural artefacts from an earlier era may – and likely would – impede adoption and assimilation of cultural influences and precursors from the more contemporary paradigm. This is why, for example, alignment between espoused and in-use theories may be consistent, but not effective. In turn, the type of anti-environment constructed via environmental perception – that, in turn, feeds effective theory – enables managers to discover obsolesced cultural artefacts lurking within their organizations. Such awareness would enable them to effect a transformation into an effective organization that is cognizant of its effects in the greater society, defining itself “in relation,” as an interdependent, rather than independent, entity. Connected? Yes. But is it Culture? Some time ago, I wrote about ephemeral artefacts, and new forms of emergent culture that are characteristic of a UCaPP (ubiquitously connected and pervasively proximate) society. Improv Everywhere's Cell Phone Symphony may not exactly exemplify high culture, but it sure reflects a form of emergent culture that captures the notion of the ephemeral artefact. And, it's a wonderful prank, to boot! The participants didn't know ahead of time what they would be doing; they were just told to bring a backpack and a cell phone. After everyone had arrived, I explained the mission to the group. The first step was to divide everyone up by cell phone brand. In addition to creating a cacophony of 60 phones going off at once, I also wanted to have different sections play at different times, like a symphony. Instead of the "string section", we would have the "Samsung section". The crowd divided into brands and each group tried to find a common ring tone that all of their phones had. The Nokia group had the "Nokia Tune", Motorola folks had "Hello Moto", etc. Those without common ring tones would either partner up with someone who did, or partner with someone else without a common tone. Agents began to pair off and trade phone numbers, deciding who would enter the store and who would be a caller. ... Once everyone was in the store with their bag checked, I called our conductor Agent Kula back in Union Square and told him it was time for the first movement. He counted down and had all 60 callers hit send simultaneously. A parody, of course, but an instructive parody.